Prince Sarmin lives in a room that measures just twenty paces by fifteen and he has lived in it all his life in secret, though whether as a protected heir or hidden threat we are not quite sure. The angels and demons on the walls speak to him and the pattern becomes ever clearer as he slips further into madness. His brother, Emperor Beyon, is the next victim of the pattern â€“ a disease that is steadily eating its way across the Cerani Empire. With the Emperorâ€™s future uncertain, those within the palace lay the groundwork for an heir, but there are several options under consideration and not all involve the hidden prince. Now that his own law â€“ death to the bearers of the pattern-markings â€“ has defied him, Beyon prepares for his demise as the pattern spreads over his body in geometric shapes of blues and reds. In a last effort to save himself he dispatches Eyul, his imperial assassin, to find a way to remove the markings from his skin. Eyul travels across the desert to seek out the help of the hermit but his path brings him face to face with a mage. The mages have great powers but are at the mercy of their elementals, and Eyul is not sure whether this mage can control hers. Far beyond the borders and conspiracies of Cerani, a simple Felt girl, Mesema, enjoys her life of riding and working for her family. Unexpectedly betrothed to the young prince, Mesema is forced to leave her home and join her future husband in the empire. But it is Beyon that Mesema ends up with rather than the hidden Prince Sarmin and, having seen a path through the pattern on her way to Cerani, her life is changed forever as the Pattern Master draws closer. 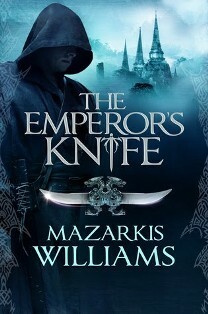 The Emperorâ€™s Knife is a well-crafted narrative set in a world of magic and intrigue and had me captivated from the prologue. This book is the first in a series and put me in mind of more classic fantasy, though with a fresher approach than the medieval-based worlds and vast intertwining plotlines that make up the bulk of the genre. The plot follows the main point of view characters chapter by chapter as each plays their part in discovering the pattern and evading its clutches. The characters are well realised and believable. The story flows well and the writing strikes a great balance between description and action. There are some unexpected twists and this is no light-hearted story by any means, with political manoeuvring and betrayal top on the agenda. For a debut novel this is certainly a piece to be admired and I expect Williams will become a solid voice in the fantasy landscape over the next few years. There is so much to recommend that it is hard to describe any more without giving away too much. The tone of the book is perfectly portrayed by the cover and in fact the only thing I didnâ€™t like was the ending and that was only because it came too soon.